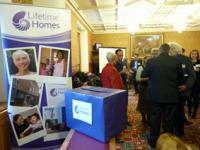 Foundation for Lifetime Homes and Neighbourhoods launches at the House of Lords. On Wednesday 3rd March 2010, Baroness Rosalie Wilkins, in association with Age Concern and Help the Aged, Royal Association for Disability and Rehabilitation (RADAR), the Town and Country Planning Association (TCPA) and Habinteg Housing Association, launched The Foundation for Lifetime Homes and Neighbourhoods. Livability Housing, formerly John Grooms Housing Association merged with Habinteg on 1st March 2010. The combined organisation will retain the name Habinteg Housing Association Ltd and will provide homes and services to over 3,400 households, of which 1200 are homes that are designed specifically for wheelchair users.